The solid RTJ-1 TransJak™ transmission jack has a 1-ton (907 kg.) lifting capacity and is built out of quality material. This telescoping transmission jack has been an industry favourite since we first released it. Typically, when removing a transmission, differential or gear box from a vehicle, you elevate the automobile or truck on a car lift (e.g., two-post lift, four-post lift). The transmission jack is then positioned centrally beneath the vehicle’s transmission and raised slightly until the transmission jack lifting platform comes in contact with the flat surface of the transmission. After determining the transmission jack is centrally positioned and properly stable, the jack is then raised further to elevate the entire weight of the transmission, so it can be safely removed from the engine block. Once elevated, the hydraulic transmission jack can be raised further to allow adequate removal clearance. Prior to removal, it is important to secure the transmission to the lifting platform via straps or chains that are typically included with each transmission jack. When working on larger vehicles, such as utility and fleet trucks, you’ll need a transmission jack with a higher lift capacity, typically ​907 kg – 1361 kg. Heavy-duty transmission jacks are designed to be completely stable when handling heavier assemblies and are easy to maneuver to ensure that large component removal is as effortless as possible. 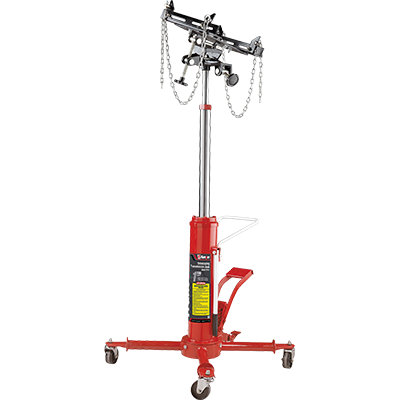 Heavy-duty models like the Ranger TransJak™ or the Ranger RTJ-3000 transmission jack tackle the large stuff but are still convenient and mobile enough to service smaller automobiles. Apart from the lifting capacity of a transmission jack, you’ll also need to consider whether you require a high or low-profile jack. 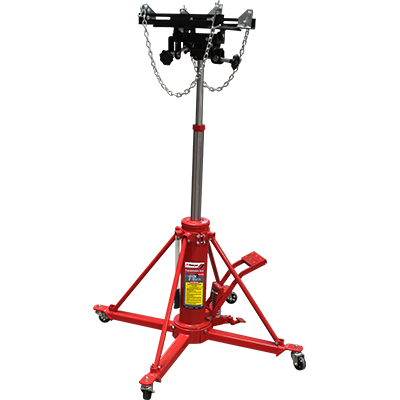 The most popular style of transmission jack is the vertical style that features an upright lifting cylinder attached to a mobile multi-caster platform. 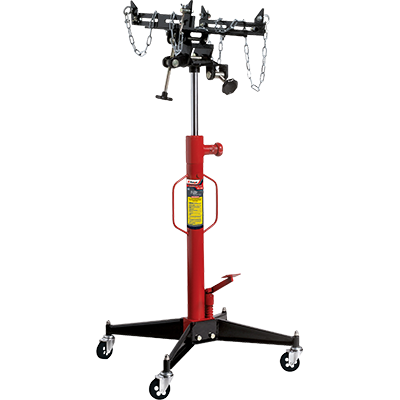 Low-profile transmission jacks, however, are best suited for workshops that have no car lift or truck lift to raise the vehicle in the air. They’re also perfect for busy shops that don’t have space for another full-size car lift but want the ability to perform additional service wherever available—sometimes temporary—space can be found. But when no other transmission jack can do the job, the heavy-duty RTJ-3000 Transmission Jack boasts an impressive 1.4-mt holding capacity, taking truck and van component-swapping duties in stride.